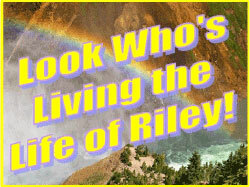 *** WINNERS *** Judy, Happi Shopr, Heather and Gina are Living the Life of Riley! CONGRATS! I want to give a big and hearty CONGRATULATIONS to Judy, the winner of the Kyjen Cushioned Pet Lookout Car Booster Seat in Medium! Judy now has 48 hours to confirm! I also want to give a big and hearty CONGRATULATIONS to Happi Shopr, the winner of the Loop Attachment iPod nano 6G Silcone Watchband! Happi Shopr now has 48 hours to confirm! I also want to give a big and hearty CONGRATULATIONS to Heather, the winner of the $40 Gift Certificate to Bright Star Kids! Heather now has 48 hours to confirm! I also want to give a big and hearty CONGRATULATIONS to Gina, the REDRAW winner of the Eyewitness: Flight and Eyewitness: Predator Books from DK Publishing! Gina now has 48 hours to confirm! One Response to *** WINNERS *** Judy, Happi Shopr, Heather and Gina are Living the Life of Riley! CONGRATS! Thanks so much. This is great, I can really use this.